Nollywood actress, Toyin Aimakhu, has made a new turn as she changes her name to Toyin Abraham. 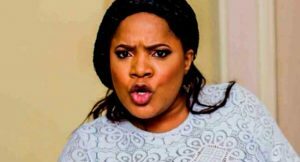 Stating her reason for the decision, the actress said “It is a family decision and I will like to be officially addressed as Toyin Abraham henceforth”. Sources said she has refused to speak further about what necessitated the move. It is believed that the change of name might not be unconnected to a number of scandals, one of which is the case of her ex-lover, Seun Egbegbe. Egbegbe, a film producer, allegedly stole nine iPhones in a shop at the popular Computer Village Ikeja area of Lagos State, southwest Nigeria. However, he purportedly told policemen investigating the incident which occurred in November that he had no intention to steal the phones. Egbegbe said he had stepped into his vehicle to pick some money when the sales boy raised the alarm.